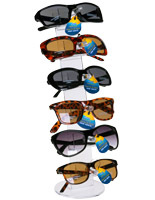 Looking for a way to showcase an expansive selection of eyewear, without using up too much valuable floor space? 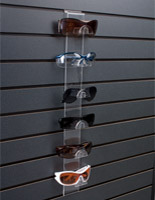 A sunglass display is an ideal way to showcase multiple pairs of eyewear in a central location. 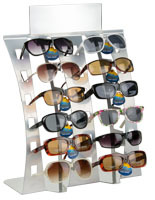 These sunglass racks are countertop or floorstanding rotating store fixtures. With mirrors featured on the sides of these displays it's easy for customers to view themselves and see how they look in a new set of frames or shades. 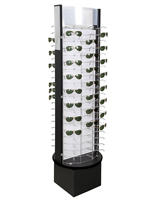 Sunglasses displays, towers and racks are available in both modern and traditional designs. Some stands even feature miniature mirrors, so customers can see how fly they look in their new shades right where they stand. Where are these eyewear stands commonly used? 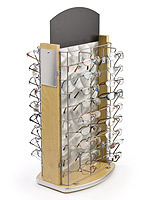 Sunglass display racks are ideal for optometrists' offices, so customers and clients can browse through frames while they wait. Department stores use stands to showcase sunglasses near beach and outdoor accessories, hoping to make a quick POP sale. Eyewear merchandisers benefit from conserving floor and countertop space by using these double-sided, rotating fixtures in their specialty themed stores. Many retailers sell cheaper pairs of shades in hopes of making a quick POS sale. Have a store in a warmer climate area or a kiosk located near a popular public beach? Use these racks to sell $5-$10 pairs so customers have a quick and cheap option for their vacation. Low priced glasses are often popular because people aren't afraid to wear them in the ocean with the risk of losing them. 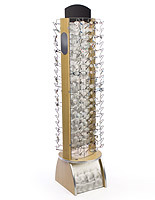 Display them on a stand that will be sure to draw customer's attention. Eyewear stands professionally showcase your objects in a way that is appealing to consumers while efficiently using retail space. Constructed from high quality materials, this sunglasses display can withstand any busy environment, and last for many years to come. Rotating displays allow retailers to conserve space by displaying many pairs in a small contained area. 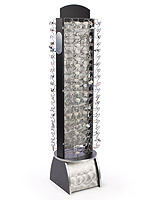 Customers are more inclined to view the whole selection when on rotating displays as well. How often do you find yourself looking at spinner racks at a store and making a full rotation to view all the products? Spinning displays improve visibility of a large quantity of products. 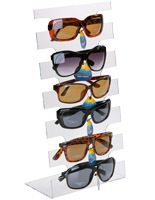 With their small footprint, the sunglasses display allows you to showcase a variety of sunglasses while taking up very little floor space. 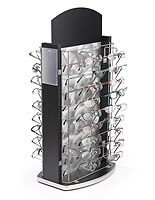 The elegant and contemporary design of this optical display makes it ideal for use in any retail stores, such as department stores, boutiques or gift shops. Some of the towers feature side mirrors, selling consumers with the convenience of being able to try on glasses without having to search for a nearby mirror. This eyeglass store fixture will definitely draw customer's attention. The whole rack rotates easily on the base, permitting consumers to choose the ideal pair of sunglasses or prescription eyewear. We include each display with a removable black header for retailers to add their own custom logo, message or sign. Choose the right display fixture with the features you need and outfit your business today!